Emlyn Morinelli McFarland is an experienced actor and improviser with a BFA in performing arts and musical theater from Emerson College. 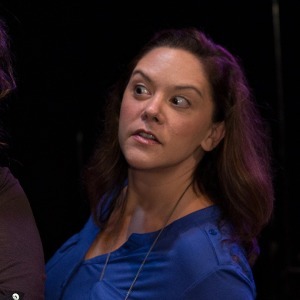 She has studied and performed with The Second City, Upright Citizens Brigade, Magnet Theater, Theater Sports NY, Comedy Sportz NY and was a cast member of Freestyle Repertory Theater New York touring the east coast with workshops and shows. Emlyn is also a voiceover artist and actor who has worked on House of Cards, cartoons such as Pokemon and The Wonder Pets as well as Internet, television and radio ads for products such as Hanes, Dunkin’ Donuts, Nintendo and Trip Advisor to name a few. She is a member of the independent improv team The Score. She has been living in New York City for the past 12 years and is happy to now be a part of the Washington Community. She has studied and performed with The Second City, Upright Citizens Brigade, Magnet Theater, Theater Sports NY and Comedy Sportz NY. She was a teaching assistant for Armando Diaz as well as studied coaching directly under him. Emlyn was a cast member of Freestyle Repertory Theater New York touring the East Coast with workshops and shows. She also has a successful career as a voiceover artist and has worked on cartoons such as Pokemon and The Wonder Pets as well as Internet, television and radio ads for products such as Hanes, Dunkin’ Donuts, Nintendo and Trip Advisor to name a few. She is now currently a member of the improv group “The Score” and is coaching and teaching improv all around the DC area.